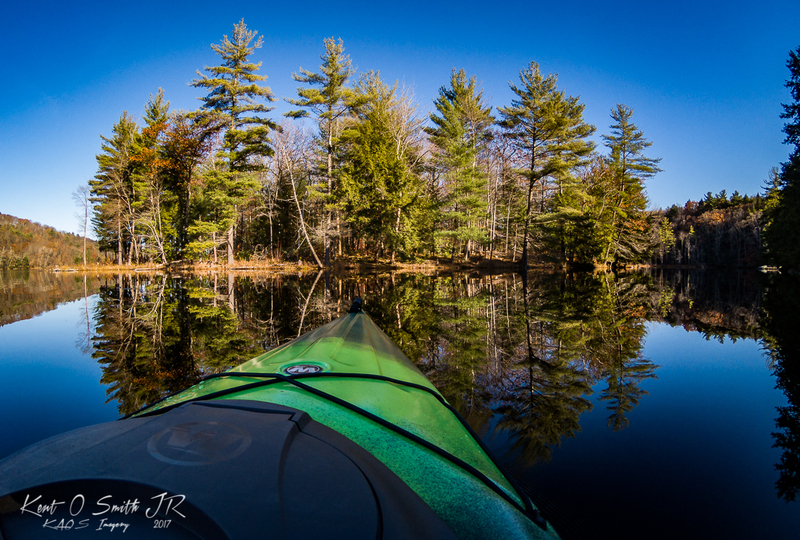 Paddling a kayak with your DSLR or cell phone camera can be a risky thing. Most pro grade DSLRs and lenses are splash proof, but not water proof. And not many cell phones are splash proof. You can use a waterproof point and shoot style camera or a GoPro in it’s waterproof case. For this shot, I used the newer Hero5 which is waterproof to 30′ without an extra housing. We launched our kayaks at the Sherman Island boat launch south of Spier Falls on the upper Hudson River in the town of Moreau. It’s a nice three mile paddle south to the next dam. Off on the right side near the dam are a few islands, some with large rock shores. This particular afternoon, there was no wind and not a cloud in the sky. The Hero5 was mounted on a short extension pole to raise it up some. The pole itself was mounted to the console on the kayak. The console is removable and one of the cup holders had a 1/4″ drain hole in the bottom. The bottom of the pole had a 1/4-20 female thread, so it was just a matter of a correct size screw and washer to hold it in place. One neat feature of the Hero5 is that it responds to voice commands. “GoPro, take a photo” is all you have to say to trigger the shutter. You can also change from still to video modes and shoot footage using the voice commands. This afternoon, as I paddled into an empty bay looking at an island, I could see the reflection of the island and sky in the smooth river. I told the Hero5 to fire a shot several times and this image was my favorite with the kayak pointed directly at the island. Camera settings were on auto since the scene would change rapidly as I paddled from place to place. I finished the image in Lightroom CC adding contrast, clarity, sharpening and a slight vignette.